Did you forget to turn in your pledge card for the “ALL IN” University Campaign? Download your pledge card today and join the “ALL IN” Campaign! 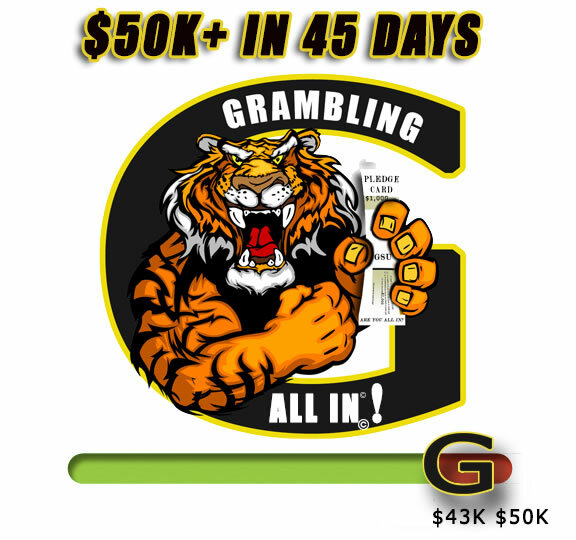 The “ALL IN” 2015- 2016 University Giving Campaign is the annual fundraising effort that offers Grambling State University employees the opportunity to show their financial support of the University, and help secure its future. A contribution to the University Giving Campaign is one of the most significant ways to support the University. The funds raised provide a crucial bridge between the university’s tuition revenue and the actual expenses of operating the University. We also encourage unrestricted giving. Unrestricted gifts are the most important gifts to GSU; they give the university the ultimate flexibility — the ability to seize opportunities and address unforeseen challenges as they arise. All departments that reach 100% participation will receive a Friday off and an extra Jeans Day for a month!!!!! Congratulations to the President’s Office, the Division of Advancement, Research & Economic Development, and Provost Office for achieving 100% Participation. Download your Pledge Card today and join the Campaign!